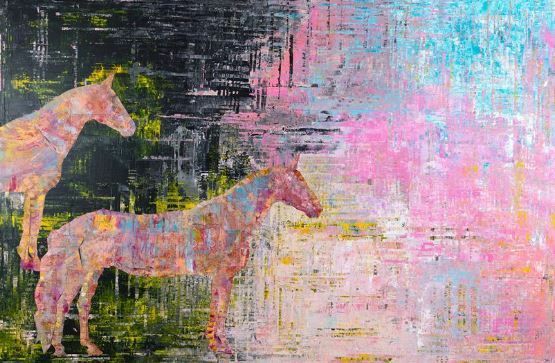 A solo exhibition of paintings by Franco-Iranian artist Sassan Behnam Bakhtiar is on display at the Saatchi Gallery in London from 15 to 27 May 2018. The exhibition is the artist’s first exhibition in the UK since his debut solo show The Real Me in 2014. Oneness Wholeness, curated by Nina Moaddel Art Advisory, showcases a new series of large scale mixed media works developed by the artist over the past few years. Many of the pieces have not been shown in public before. Sassan Behnam Bakhtiar’s work fuses together ancient and modern Iran. His paintings examine philosophy, ritual and form in tandem, underpinned by Iranian culture. Ancient Persian motifs are interwoven with motifs of contemporary Iranian identity. The Zagos Mountains, the source of Sassan’s family lineage, the Bakhtiari tribe, are an important reference whose influence is repeatedly seen in the paintings. Oneness Wholeness is on display from 15-27 May 2018 at Saatchi Gallery, Duke of York's HQ, King's Road, London SW3 4RY. Stay out of gray zone. Join our newsletter. Discover art.